Home Tags Posts tagged with "national museum of natural history"
US scientists have discovered a new animal living in the cloud forests of Colombia and Ecuador. It has been named olinguito and is the first new species of carnivore to be identified in the Western hemisphere in 35 years. It has taken more than a decade to identify the mammal, a discovery that scientists say is incredibly rare in the 21st Century. The credit goes to a team from the Smithsonian Institution. “It stopped me in my tracks,” said Kristofer Helgen. Dr. Kristofer Helgen is curator of mammals at the National Museum of Natural History in Washington DC, which houses the largest mammal collection in the world. The 14 in-long olinguito is the latest addition to the animal family that includes racoons. By comparing DNA samples with the other five known species, Dr. Kristofer Helgen was able to confirm his discovery. “It’s hard for me to explain how excited I am,” he says. Dr. Kristofer Helgen has used such mammal collections to identify many other new species, including the world’s biggest bat and the world’s smallest bandicoot. But he says the olinguito is his most significant discovery. Its scientific name is Bassaricyon neblina. The last carnivore to be identified in the Americas was the Colombian Weasel. 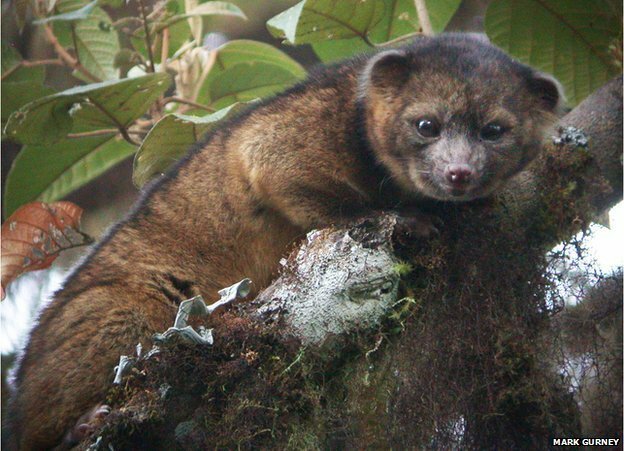 The olinguito is now known to inhabit a number of protected areas from Central Colombia to western Ecuador. Although it is a carnivore, it eats mainly fruit, comes out at night and lives by itself, producing just one baby at a time. And scientists now believe an olinguito was exhibited in several zoos in the US between 1967 and 1976. Its keepers mistook it for an olinga – a close relative – and could not understand why it would not breed. It was sent to a number of different zoos but died without being properly identified. “The vast majority of the discoveries of new species are made in museum collections,” says Chris Norris, of the Yale Peabody Museum of Natural History in Connecticut and president of the Society for the Preservation of Natural History Collections. But there is no central museum database and scientists have little idea of what each collection contains. Many organisations are now putting their inventories online, and Dr. Chris Norris says that will make research faster and more accessible. Another challenge is keeping specimens in good condition. Many are hundreds of years old and are prone to moth and insect infestations. The oldest surviving collection was assembled in the 17th Century by John Tradescant. Its most famous specimen is a dodo that is now on display at the Oxford University Museum of Natural History in the UK. “But not all of it,” says Dr. Chris Norris. “There’s just the head and a foot left because everything else got eaten. “It’s a cautionary tale for anyone working on museum collections today. You get to do exciting science but you have to take care of them or they won’t be there for people to use in the future. Scientists have catalogued only a fraction of the planet’s lifeforms. New species of insects, parasitic worms, bacteria and viruses are discovered on a regular basis, but new mammals are rare. “This reminds us that the world is not yet explored and the age of discovery is far from over,” says Dr. Kristofer Helgen.